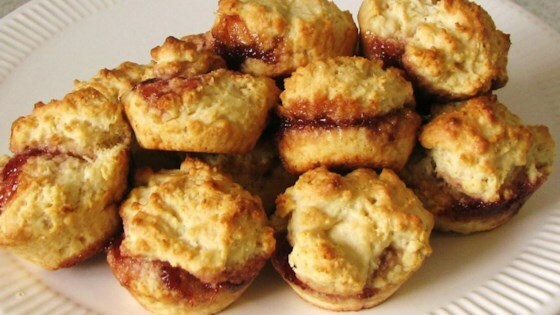 "Jam-topped muffins. These are great for breakfast!" Heat oven to 400 degrees F (205 degrees C). Grease bottoms only of 12 muffin cups or line with baking cups. Fill cups 2/3 full. Place 1/2 teaspoon any flavor jam on each muffin before baking; press into batter. If desired, sprinkle with finely chopped nuts. Bake for 20 to 25 minutes or until toothpick inserted in center comes out clean. Cool 1 minute before removing from pan. Serve warm.